As Curator-in-Residence, Sylvie Fortin will participate in Bemis Center's Residency Program, serve as a professional resource to Bemis Center artists-in-residence and the Greater Omaha arts community, and organize exhibitions and public programs at Bemis Center through January 31, 2021. Sylvie Fortin is an independent curator, researcher, critic, and editor. She was Executive/Artistic Director of La Biennale de Montréal (2013–2017) and Executive Director/Editor of the Atlanta-based ART PAPERS (2007–2012). 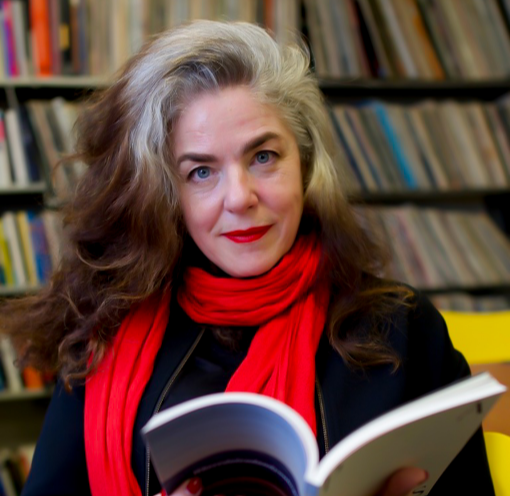 Her curatorial posts have included Curator of Contemporary Art at the Agnes Etherington Art Centre at Queen’s University (Kingston, Ontario, 2013), Curator of Manif 5 – the 5th Québec City Biennial (2010), Curator of Contemporary Art at the Ottawa Art Gallery (1996–2001) and Program Coordinator at LA CHAMBRE BLANCHE (Québec City, 1991–1994). Her critical essays and reviews have been published in numerous catalogues, anthologies, and periodicals, including Artforum International, Art Press, C Magazine, Flash Art International, Frieze, Fuse, NKA: Journal of Contemporary African Art, and Parachute. She also initiated Pass, the International Biennial Association’s journal, and edited its inaugural issue (2018). She is currently researching the currencies of hospitality. Sylvie Fortin. Photo: C. Daniel Dawson. An excerpt of this interview with artist Nancy Friedemann-Sánchez was published in Bemis Center’s quarterly publication, Time + Space. NANCY FRIEDEMANN-SÁNCHEZ How and why did you become a curator? SYLVIE FORTIN I became a curator somewhat by luck. Doesn’t luck, understood as the ability to seize an opportunity, play a part in much of what we do? I was working as a docent/tour guide in a small art center in the suburbs of Quebec City to make extra money and to gain experience while studying. Having spent significant time looking closely at the work and reading a lot of additional materials about the artists, I began adding to the approved tour ‘script’. I would bring in the recent scholarship, share my own questions to empower visitors to ask theirs. One day, I realized the director had heard part of my ‘expanded’ tour. When she called me to her office, I thought I’d be fired. Instead, she invited me to organize the summer show, a temporary outdoor sculpture exhibition. I had never really thought about organizing an exhibition, nor did I have any experience. So I started with what I knew: research. I read everything I could get my hands on: magazines, catalogues, and books. I saw many exhibitions. I reached out to artists in Quebec City and Montréal. I went to see them to learn more about their work. I learned a lot from my first exhibition, which was well received by the community and the critics. This project led to my next (first) full-time art job. A few of the artists included in this show were on the board of La Chambre Blanche, an artist-run space involved in questions of production, site and site-specificity, writing, publishing, and residencies. The organization was hiring a Program Coordinator. They had interviewed their top candidates but hadn’t found the right person. Out of the blue, I received a phone call asking if I would be interested in interviewing for the position. They said, come straight away, the committee is here. So I went. I knew the organization and several of its artist board members but I didn’t know anything about the position and its requirements. We talked for a few hours about art, ways to support artists and their production, and how to remain relevant as an artist-run center. The next day, they offered me the job. I have never looked back since. I worked there for three years. We accomplished a lot. Most notably, we bought the building where we were located (the former home of the Québec Heel Co. Limited, an industrial building not unlike the Bemis, but smaller) and celebrated the organization’s 15th anniversary with a year-long program of residencies pairing artists with writers, a groundbreaking citywide project of site-specific works by 15 artists in hotel rooms around the city and two major publications. Together, these initiatives redefined the center’s relationship with the local community while welcoming practices from around the world. These were situated projects addressing our complex reality: the capital of a Canadian province working out its separatist aspirations, a city designed for the theater of diplomacy and the pomp of statehood, a place struggling to find a balance between the weight of history and needs of the present, a city whose ‘tourist section’ is set apart from the daily lives of many of its citizens. These projects sought to give citizens greater access and, by extension, ‘rights’ to their city. This period—the early 1990s—was also the time when the terms ‘curator’ and ‘curating’ emerged. The first curatorial studies program was founded in France in 1987. Next came the Royal College’s program in London in 1992, followed by de Appel’s in Amsterdam, and Bard College’s in Ghent, NY in 1994. Now, of course, these terms have been codified—both reduced and disseminated—and there is a worldwide curatorial studies industry. When I started—not that long ago—the practice was still nameless. People simply said they organized exhibitions or called themselves exhibition makers (kunstmacher). I was (the youngest) one of the four conveners of an important conference at the Banff Centre for the Arts, entitled “Naming A Practice: Curatorial Strategies for the Future” in 1994. We were bearing witness to an expanding practice, which did not exclusively come after the fact of objects. It came along the way, with projects. Despite the initial emancipatory promise of curating in the early 1990s, the practice was quickly corralled (today, one is either institutionally affiliated, precariously 'independent', or academically engaged in curatorial studies). I remain committed to the unfulfilled potential of critical curating. Informed by Fred Moten’s 'undercommons,' I am experimenting with alternatives to these orthodoxies, working with diverse assemblies connected across geopolities. FRIEDEMANN-SÁNCHEZ What are the curatorial themes that inspire you or that you consistently go back to? I don’t really work thematically. I never did. Even as a magazine editor—periodical publishing being traditionally thematically driven—I always resisted themes. While some believe that themes increase accessibility, they’re often little more than a marketing strategy, a way to capture a target audience. The danger with themes is that they convey authority while being restrictive and divisive. I hope to develop other kinds of relationships with artists and their works, and with publics. I don’t want to position myself as the authority. Nor do I want to filter or confine the viewer’s encounters with works and with each other through the limits of a theme. The danger of themes is that they require that you deny many dimensions of the object, practice, or phenomenon studied. I don’t want to deny or reduce. I seek to propel elaboration. I am inspired by open-ended questions and experimental processes. My approach is often driven by immersion, followed by common questions. First, you give yourself to the work, you welcome it, you mobilize all your knowledge and experiences, taking in all that you can process. Then, you ask, “Is that all?” There is always more. No artwork can ever be experienced in its totality. It lives in an endlessly distributed fashion, in and across the collectivity of its viewers. You look askance, zoom out to your limits. You zoom out, from the work, to the space and the other people who are there with you. You consider how you got there, in a movement from the work, to your community, to the world. The kind of question that many of us ask ourselves about our lives, our careers, our relationships, our world. This kind of common question is a safeguard against the false gods of progress and novelty, quick categories like generation or technology and the comforts of media. It invites you to dig deeper, to push your thinking, to consider the otherwise, to elaborate. It requires humility, creativity, improvisation, and the capacity for wonderment. It’s also very pragmatic. So, I tend to elaborate questions rather than explore themes. My collaboration with Bemis will be part of my current, long-term curatorial inquiry into the contemporary currencies of hospitality. I’m using the term ‘currencies’ to create a constellation of meanings that includes currency as financial instrument; currency as the quality of something broadly accepted; and by extension, contemporaneity, and flows. This inquiry grows out of my frustration with our current lack of political hospitality as well as our failures of aesthetic hospitality. I’m trying to mobilize these currencies to get us somewhere else. FRIEDEMANN-SÁNCHEZ Your residency will take place in stages. Clearly, this will allow time to reflect on Omaha and the Midwest. Based on your knowledge of the area, how are you planning to focus your time? FORTIN My residency will take place over a few years. I’m excited Bemis welcomed my proposal, which was quite different from the format of its previous collaborations with Curators-in-Residence. I’m glad that they are willing to undertake this experiment. This new format will allow for deeper engagement with Omaha and a more sustained collaboration with Bemis, its team, artists-in-residence, and alumni. I am particularly excited to be spending significant time with each of the cohorts of artists and to intersect with Bemis Center’s new experimental sound expansion. Outside of the main art institutions, I don’t know really the Midwest. To some extent, I know Kansas City because ART PAPERS used to be printed there. As editor-in-chief of the magazine, I’d travel to Kansas City every two months for press checks. I took advantage of this situation to get to know the arts community in KC. I’m looking forward to learning from Omaha and the greater Midwest. First, I’m planning to get to know the local arts community and to connect with local researchers and community organizations. I’m particularly interested in the medical research going on in Omaha, in the region’s natural environment, in its relation to the Missouri River, and in questions of migration and translation. I’m looking forward to stimulating exchanges that will dynamize the community. I’m also hoping to bring Bemis into an expanded international network to produce dynamic collaborations that support artists’ mobility, the development of ambitious ideas, and hospitable institutions. FRIEDEMANN-SÁNCHEZ Have you considered possible themes for your exhibitions at Bemis? FORTIN Over the next few years, I’ll be developing exhibitions and several public programs for Bemis Center. I’m also hoping to develop publications. I’m thinking of these exhibitions as a sequence of experiments. Each of them will, of course, stand on its own. They will also constitute a constellation. My inquiry into the currencies of hospitality is driven by a series of questions that cut across the arts and the humanities, sciences, translation, law, economics, and more. At Bemis, my approach will be situated. I look forward to developing the questions that resonate most productively in Omaha. And, of course, this situatedness begins with Bemis, with its current and upcoming programs, the artists who will be in residence during my tenure, with its institutional history, with the communities of artists who call Omaha home, and its ever-changing citizenry.